← 13 "Bart and Homer's Dinner"
Space Patrol is the fourteenth short. It aired on The Tracey Ullman Show on November 8, 1987. Homer and Marge are gone, so Bart, Lisa, and Maggie decide to play Space Patrol. Lisa (with a saucepan on her head) is devil-may-care rocket pilot Lisuey and Maggie (also with a saucepan) is her spunky sidekick named Magina. 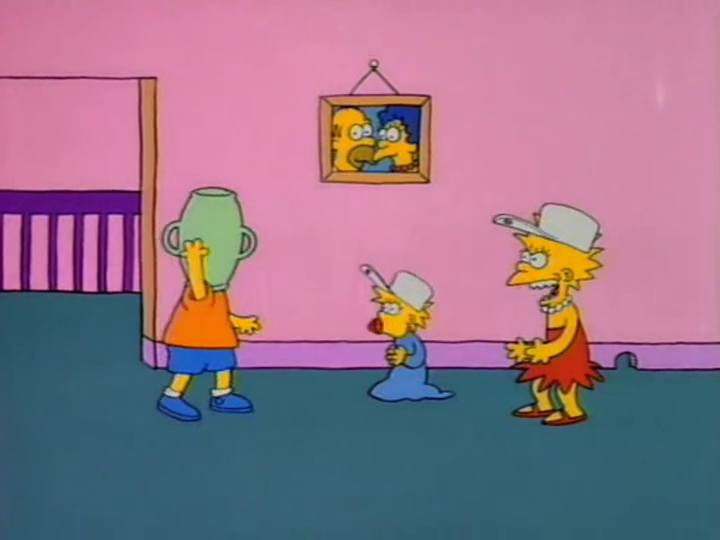 Bart is Bartron, an evil robot from Mars gone berserk, so dubbed by Lisa after she puts a vase on his head. Then, Lisa and Maggie (also wearing red capes) are "in mortal danger of being liquidated by the horrible robot from Mars", as Bart steps on Maggie's cape. Lisa pulls Maggie away, tripping up Bart and making him fall down. Lisa says that perhaps next time Bart will turn from his evil ways. Bart stands up again. Because the vase covers all of his head, he has his arms outstretched trying to feel where he's going. Lisa and Maggie poke him with broomsticks. Bart tries to talk, but with his voice muffled by the vase, all that comes out is "lmmmke thmmmph". Lisa tells him to calm himself and tell them the hiding place of the magic space crystals that can save the galaxy. She and Maggie poke Bart again, and he can only mutter "Mmmfmmmphfhmmpfm". Lisa tells him to speak American, because she and Maggie (the Earthlings) don't understand the Martian tongue. Bart wanders down the hallway and ends up at the top of the stairs. Maggie pokes her head through a doorway, sticks out her broom, and trips Bart, making him fall down the stairs. Bart is now lying on the stairs, the vase still stuck on his head, and stars and spirals streaming from his head, while Lisa and Maggie admire their handiwork from the top landing. Maggie is hailed as she has rendered Bartron's anti-gravity belt non-functional. Bart wants to get the vase out of his head and tries to remove it (with no success). Lisa asks him if he wants her to release him from the helmet of evil thoughts with her enchanted space wand. Bart tries to say "yes, yes, yes", but it sounds more like "Mmph, mmmph, mmmmmph". Lisa says that she will do it but no one will know what mysterious forces might be unleashed. Lisa then smashes the vase. Bart's face is disfigured, his eyes askew. 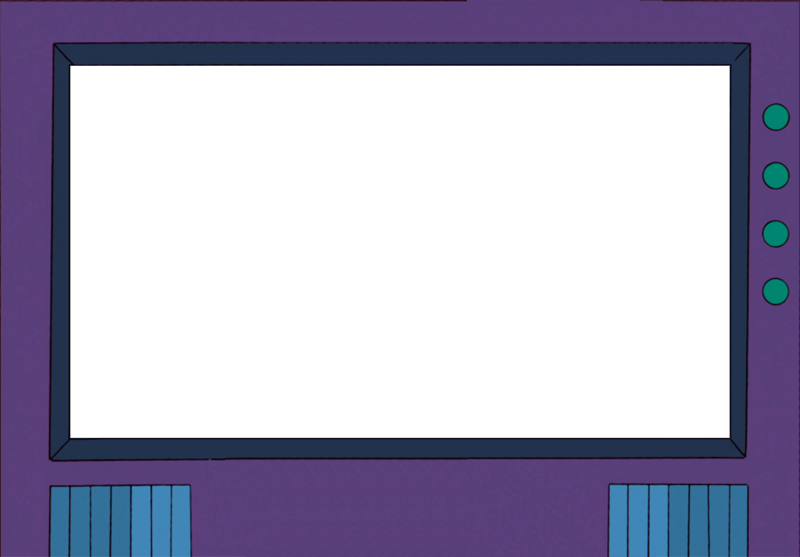 Lisa says that inside the evil Bartron is a horrible mutant boy. Bart then stumbles around, while Lisa and Maggie are behind the couch, where they will be safe till Homer and Marge (the evil overlords) come home. Modified on August 2, 2013, at 06:05.